Quick: You have a last-minute party to go to, and you want to dress to impress. What do you reach for in your closet? We don't blame you if it's an LBD and a clutch, but there's no harm in expanding your horizons, especially when it comes to accessories. If you're in the market for fresh buys, you're in luck: There's a new party bag in town that just might replace your old reliables. Sophie Hulme has just released a new collection of evening bags for Resort 2017, and we're coveting all of it. In particular, we love the Compton Evening Totes, which are named after the street where the brand's UK studio is located. The mini top-handle totes are equal parts adorable and chic—how could we not love them to pieces? The prices are certainly investment-level, but even if you don't shell out for these particular bags, we hope they'll convince you to try out fun, new accessory silhouettes this season. 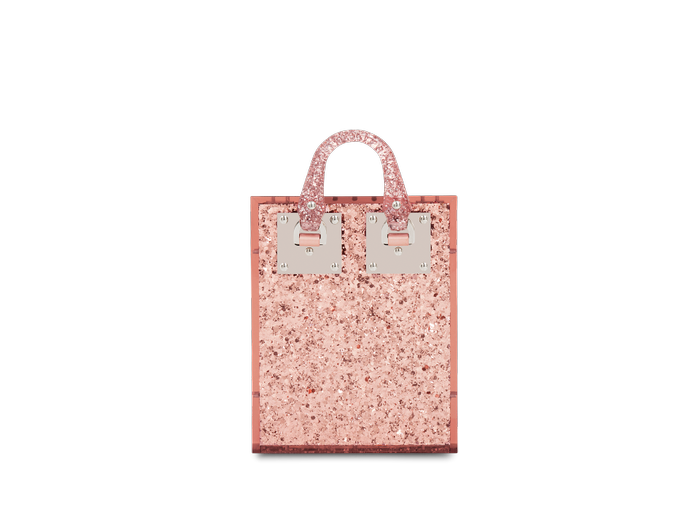 Scroll down to shop Sophie Hulme's new evening totes! Girly-girls will go crazy for this pink glitter version. Black and gold is a fail-safe color combo for every occasion. This rainbow version is begging to come along to your most festive fête. What's your go-to party accessory? Tell us in the comments below!